Australia isn’t the only country Down Under with a holiday this season. (See my last Australia Day post.) New Zealand also has a national holiday today called Waitangi Day! The occasion inspired me to learn more about the beautiful country of New Zealand, and to celebrate New Zealand’s culture in my own small way. As usual, celebrating my way begins in the kitchen! 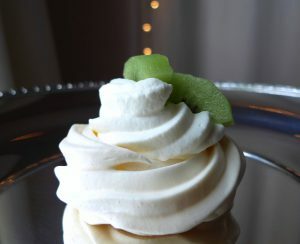 I made another batch of mini Pavlovas for the special day. 🙂 No one really knows if the first Pavlova was made in Australia or New Zealand, so I thought I’d give both countries recognition. (And if I’m perfectly honest, it just gave me an excuse to make another batch of this dreamy dessert! 😉 ) I topped these New Zealand Pavlovas with sliced kiwi fruit. Pipe a little whipped cream over the top of each meringue, and finish with a few pieces of sliced kiwi on top.